This is a simple recipe, a tray bake if you like. It is one my mum would make regularly when I was a child. Once I was old enough I was allowed to help and that meant I loved it even more. My mum calls it Mars Bar Block. You know it is going to be good now, don't you? 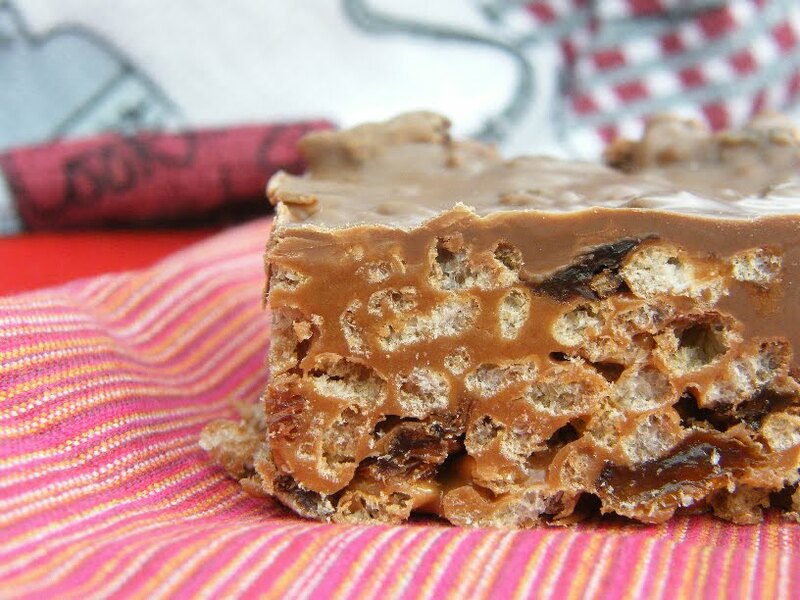 Slice the mars bars into a small pan, add the syrup and melt over a gentle heat. Pour the hot chocolate sauce into a large bowl and add the rice krispies and sultanas. Mix until the rice crispies are well coated with the chocolate mix and the sultanas are well distributed. Pour into a brownie pan and spread out. Break the chocolate into pieces and melt in a bowl over a pan of simmering water. Make sure the bottom of the bowl does not touch the water. 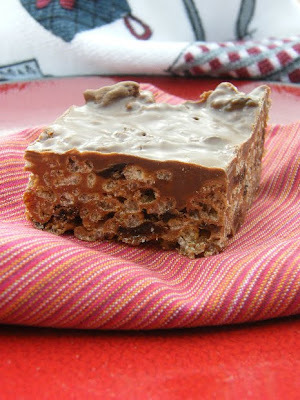 Spread the chocolate over the rice krispie base and leave in the fridge to cool and set, then cut into slices. My mum recommends marking out the squares before the mix is quite set, making it easier to cut. I am entering this recipe into this month's Sugar High Fridays, which is being hosted this month by Susan, The Well Seasoned Cook. This month's theme is Bar Cookies. Whether they are one-bowl brownies, butterscotch-y blondies, or elaborately layered creations of textures and tastes. If you want to join in, submit your entry by the 21st June 2010. To find out the details for this challenge and many others, as well as competitions and giveaways, then head over to The Food Blog Diary. 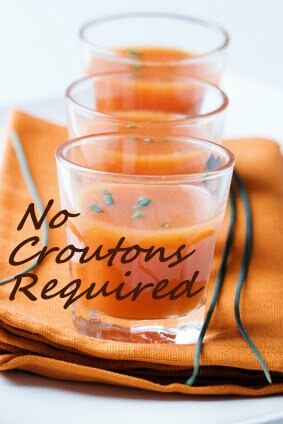 And while I am on the topic of challenges remember to get your entries for this month's No Croutons Required in before end of day on the 20th June 2010. The challenge this month is to make a soup or salad featuring Courgette/Zucchini that is suitable for vegetarians. I don't believe I've ever seen a mars bar. What is it? Aye, an alternative to the deep-fried MArs Bar...this must be tasted! Hi Chele, it is soft nougat and caramel coated with milk chocolate. Mmmmmmmmm! Nah, that's just an urban myth Peter, now haggis, those we beasties actually exist! I haven't had a Mars bar in years... and now not only do I want one, but I want one of these bars, too! Oh no! I am sorry Michelle, those kinds of cravings are the worst. I bet you could cry? Oh my goodness, Jacqueline, this sounds totally phenomenal. Is there something about Scottish and Mars bars?--isn't your country the originator of the deep-fried Mars bar, too? I used to make something similar - i love it straight from the fridge when you almost break your jaw on it! I prefer it chewy CC. Either way it was too tempting, so I had to give it to Graham to take to work. MMMMMMM,..I so much love this tasty & superb caloryfull creation!!! Yum - the bars look amazing. I love mars bars. Hi Beth, It must have been of a generation, this recipe. I love the name Lowen. Jac! You star! I haven't seen Mars Bar Slice in years - my Auntie used to make it for all our family get togethers and I was a complete Mars Bar Slice pig!!! Wow...great looking bar. What is a sultana? This made me laugh Jacqueline - sugar high is the operative word! But I wouldn't turn one of them down if offered. Definitely worth blogging about. Hi TB, It is a dried white grape and a raisin is a dried red grape. I do prefer raisins, but this is my mum's recipe and they are good in this. Okay these look a little too dangerous to have around the house!! Yum.